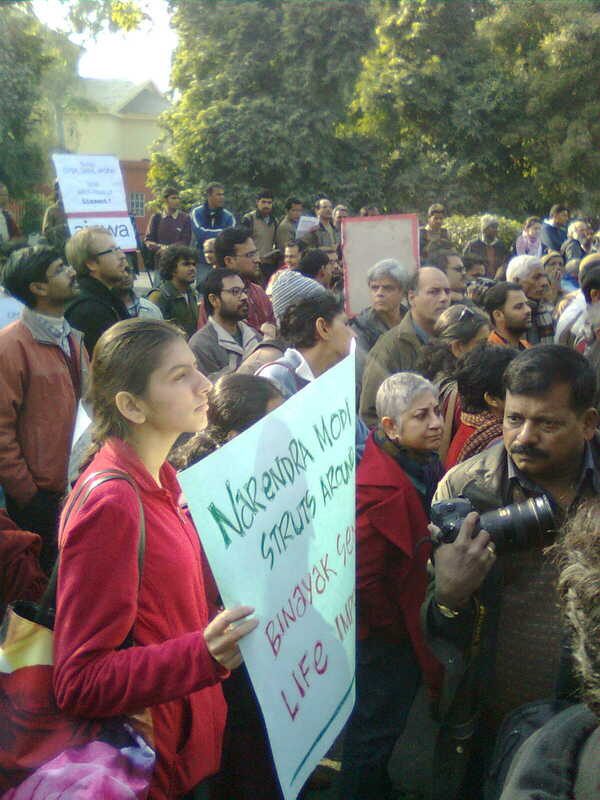 I went down to Jantar Mantar a week ago Monday to protest the life sentence given to Dr Binayak Sen. I was expecting to see a few dozen protesters, but was pleased to see a large crowd of several hundred. There were plenty of good speeches, songs and chants. I wasn't taking notes, but there was a doctor there who has worked with Dr Sen for years and her testimony as a colleague and friend was moving. And many speakers reminded us that as extraordinary as this verdict is, there are many, many more people in similar circumstances who we will never hear about because they are not award winning doctors with access to an international audience. Yes, we want to free Dr Sen, but we must also reform the laws and courts so that this kind of thing won't keep happening. Mrs. Batti and the litte Batti's came along--the kids were on holiday from school, after all. Why not? I think most kids can understand the importance of human rights. My ten year old got tired from standing after a while. He asked to go sit on the curb, saying, "It doesn't matter exactly where we stand, right? It's our presence that matters." He was more right than he realized, I think. Whether we're young and old, rich or poor, right, left or centre, it really doesn't matter on this issue: freedom of expression and freedom from arbitrary use of state power are things that matter to all of us. We've just got to make our presence felt. You can start by signing this letter to the President. You can also join the Free Dr. Binayak Sen Campaign on FB and spread the word by blogging, emailing, or sending letters to the editor of your favorite newspaper. Hard News has a story and links to other stories. Here's a summary of the case from the Times of India, via Kafila and written before the verdict. I agree - we must show as much support as possible for the freedom of speech as long as there is no direct incitement to violence. @Bhagwad--yes. There is a very good chance this verdict will be overturned upon appeal. But at what cost? The problem is that if there is not a high standard for prosecution in these cases at all levels, the process becomes the punishment--and that has a chilling affect on all kinds of expression. And with all the problems we are facing, the last thing we need to do is limit expression and ideas.